Even though John Fogerty has penned some of the most beloved songs in rock history, he still marvels, more than five decades into his career, that he didn’t become a one-hit-wonder. Most listeners, on the other hand, marvel at just how many tunes he placed on our cultural soundtrack; between 1968 and 1972, the Fogerty-led Creedence Clearwater Revival notched 15 top-20 hits, and he’s had solo scores since. The very fact that “Bad Moon Rising,” “Born On The Bayou,” “Fortunate Son” and “Proud Mary,” among others, are familiar to so many means pairing with other talents to re-record them was a gamble that could have backfired as badly as trying to re-create Woodstock. 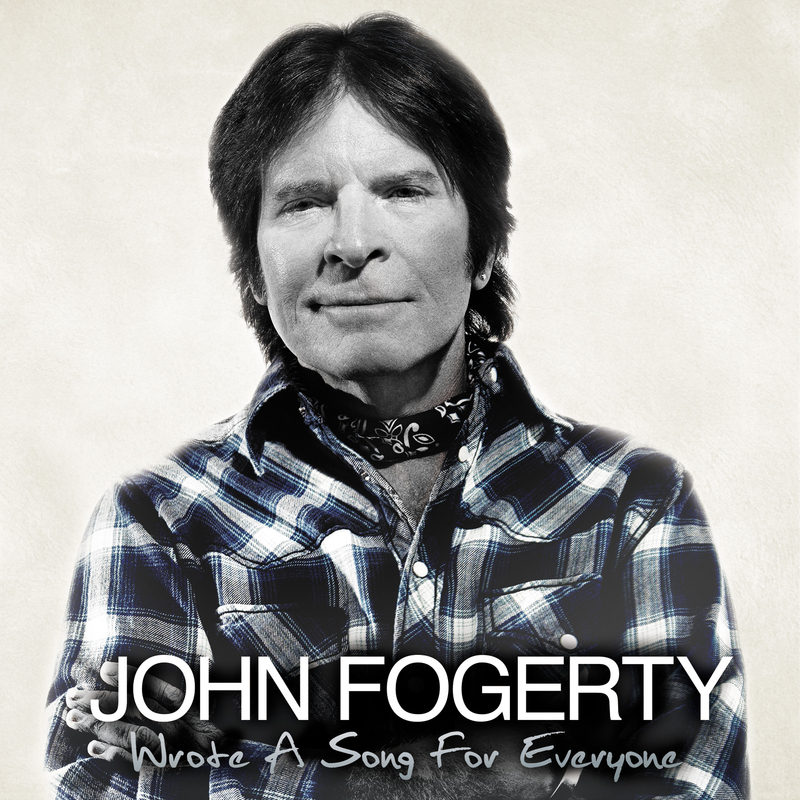 Fortunately, Fogerty knew the risks and sought to rise above mere sing-along gimmickry, inviting his partners to share ideas for their tracks. Wrote A Song for Everyone, the result, is, at times, revelatory. Fogerty and the Foo Fighters hit the ground running on “Fortunate Son,” making the anti-war tirade loud and fast and angry, with guitar interplay that rocks even harder than the original. And with the hindsight of decades in which nothing’s changed, the song’s lyrics now carry an even sharper sting. On “Almost Saturday Night,” Fogerty and Keith Urban meld their similarly timbred voices in a jubilant arrangement full of banjo and mandolin – two instruments Fogerty likely wouldn’t have dreamed of using when he originally recorded it in 1975. But there’s also a little too much backing-vocal sugar; it’s been sprinkled on “Born On The Bayou,” “Train Of Fools” and “Proud Mary,” too. That’s one of the few flaws in an otherwise very strong collection; Fogerty didn’t just re-energize these songs, he transformed many of them into something completely new. “Bad Moon Rising,” for example, shifts into a back-porch/honky-tonk charmer with blues harp, fiddle and organ. Fogerty and the Zac Brown Band must have had a blast firing off tremolo guitar solos; they also drop in a cool a cappella raveup and soul shouts that make it feel like a real Saturday-night party. “Long As I Can See The Light,” with My Morning Jacket, sounds like the Sunday morning after, both melancholy and celebratory. A soulful, bluesy gospel-rocker, it’s full of emotion – and even clearer meaning. In fact, many of these songs sound clearer; Fogerty’s diction certainly has improved with time, though his southern-fried accent (marinated almost entirely in California) is still intact. It’s quite noticeable on “Lodi,” a song full of tasty chicken-pickin’ – courtesy of Shane and Tyler Fogerty, as well as their father, whose playing deserves more recognition than it typically gets. He really revs up that six-string engine on “Hot Rod Heart” with Brad Paisley. The two conduct a James Burton-inspired axe duel which Fogerty has likened to a wild-west shootout (he claims Paisley won, but it’s clearly a draw), and top those luscious licks with sweet harmonies to create a tune country radio should jump all over. Speaking of country, Fogerty and Miranda Lambert harmonize well on the title track – then Tom Morello zips in for a cascading solo, teasing high notes from his guitar neck in an arrangement that also features well-placed keyboards and mandolin. “Who’ll Stop the Rain,” with Bob Seger, and “Have You Ever Seen The Rain,” with Alan Jackson, don’t change radically, and the new “Train Of Fools” doesn’t feel particularly memorable. But another new tune, “Mystic Highway,” picks up intensity after an a cappella break that elevates it substantially, as if it’s two different songs. Kid Rock wanted to elevate “Born On The Bayou,” a tune he was born to grind out in all his good ol’ boy glory. And he would have; there’s enough grit in his vocals and the stellar guitar attack to sand an alligator’s hide to nubs. But that backing-vocal punctuation steals some of Kid’s swamp-creature sleaze. Everyone’s fingers and toes stayed intact, but the song lost some bite. One could almost say the same for “Proud Mary,” with Jennifer Hudson, Allen Toussaint and the Rebirth Brass Band. It morphs from the Creedence version to the Tina Turner tour de force, but a different approach altogether might have been interesting. Still, there’s no denying Hudson’s chops. The better closer, however, would have been “Someday Never Comes,” with Dawes. It’s an affecting version, impeccably arranged, that stuns with soulful beauty. If there’s anything these songs show us, it’s that composers should feel free to approach their work as Monet approached his water lilies, revisiting them constantly and painting them differently each time. Call it the Let It Be … Naked effect. Apparently, it’s never too late for a re-do.